Harold Beckett directs a choir in 1960. 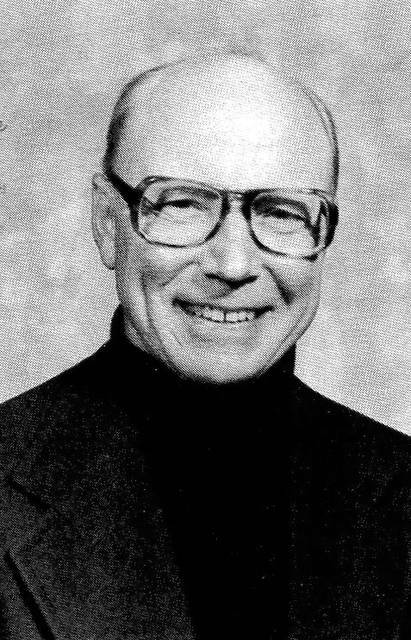 Harold Beckett, photographed in 1982. Harold Beckett directs a choir in 1966. Harold Beckett sings in this photo, dated Nov. 17, 1985. 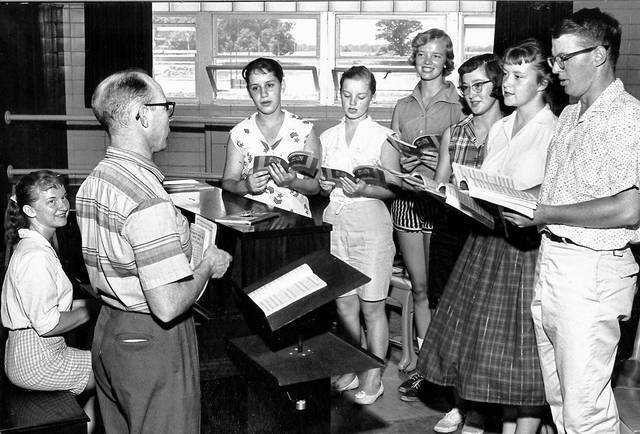 Harold Beckett directs a choir in about 1963. Harold Beckett directs a group in the summer of 1959. This feature is a cooperative effort between the newspaper and the Allen County Museum and Historical Society. An open house in memory of Beckett will be from 2-4 p.m. Dec. 2 at Shawnee United Methodist Church. The announcement was unusual because, when it came to music, Beckett seemingly never rested. In the late 1990s, Beckett again decided it was time to take a step back, this time from the position of cantor at Lima’s Temple-Beth Israel-Shaare Zedek, which he had held since 1951. “He lasted for about a year and asked if he could come back. 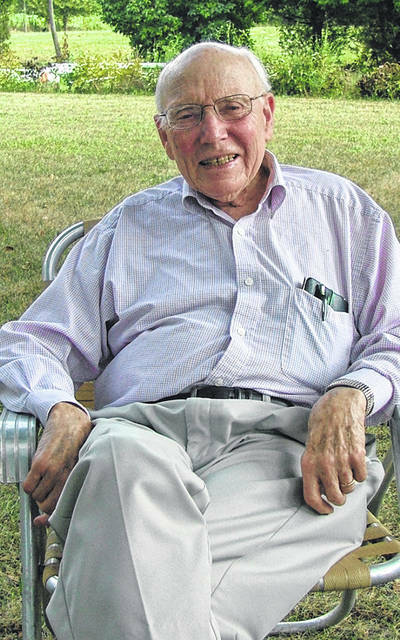 He missed the warmth and the camaraderie and the music,” member Connie Hornung recalled in a story in the March 27, 2002, edition of the Toledo Blade. During the Great Depression, with his father out of work, he sang so his family could eat, competing for prize money on amateur nights against comedy and novelty acts. “Three dollars could feed a whole family of five for a week. This was when bread was a nickel a loaf. We ate a lot of cornbread and beans in those days. And my mom was good at making money stretch,” he remembered. Beckett served in the combat infantry during World War II. He attended Ohio State University, receiving a bachelor’s degree in music education and a master’s in vocal pedagogy. In 1947, he married Juanita and the couple had two sons, Thomas and Jeffrey. Beckett’s decision was a fortunate one for all the local choirs he would direct, all the religious services to which he would lend his baritone voice and skill at directing choirs, all the high school musicals he would oversee and all the amateur musical productions he would enrich. And fortunately for Temple Beth Israel, the position of music teacher at Shawnee didn’t pay that well in the early 1950s. “We had a new baby, and this job (cantor) paid $5 a week in those days. I had no idea what I was getting into,” Beckett said in the 2002 Blade interview. 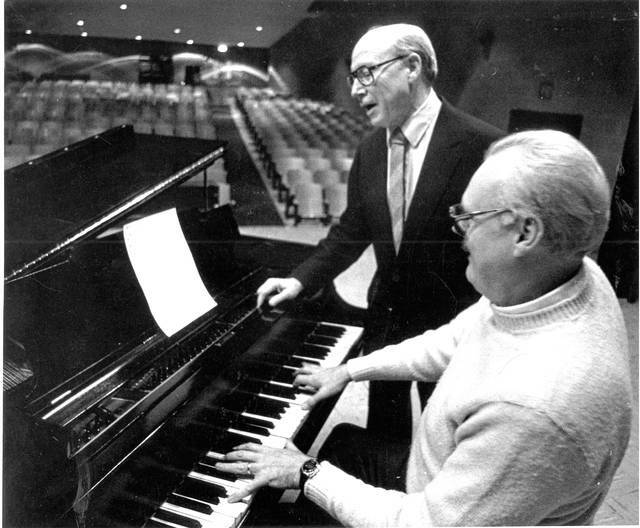 “Beckett, who both taught and studied music at Ohio State University became the choir director at Grace Methodist Church in 1951, working alongside the church organist who also played at the Jewish temple. She told him about an opening for a cantor at the temple,” the News wrote in a Jan. 2, 2002, story. The ever-busy Beckett made his presence known before the leaves had fallen during his first year at Shawnee with the announcement of a “special Armistice Day program” to be given by the eighth-graders on Nov. 10, 1950, and a presentation by the “mixed chorus boys’ and girls’ glee clubs” for the school carnival a week later. 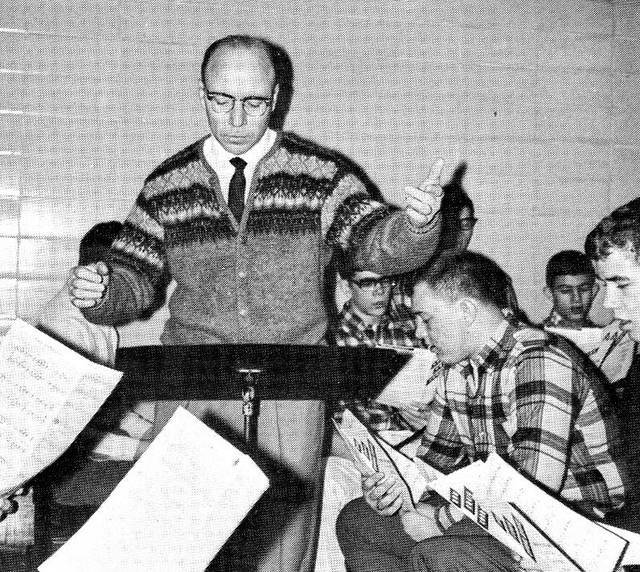 Until his retirement from the Shawnee schools in 1982, Beckett directed choirs, glee clubs and school musicals, and took his young singers to perform at PTA meetings and service club meetings, sometimes joining in. 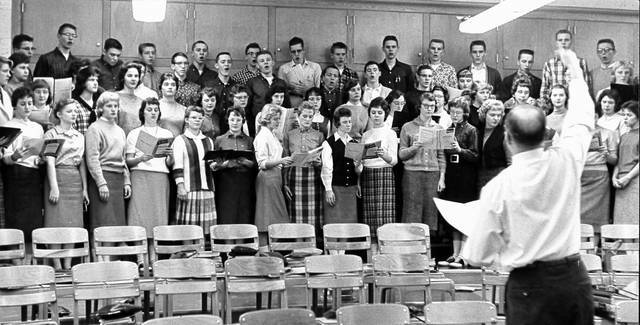 When the Shawnee choir performed at a February 1952 meeting of the Optimist Club, “Director Harold Beckett offered his own rendition of ‘Lord Randall,’ a Scottish folk song,” the News wrote. Beckett also helped organize an area Eisteddfod (Welsh singing festival) shortly after arriving in Lima. Eisteddfod had been popular in the late 19th and early 20th centuries. In addition to his work with the schools, Beckett directed choirs at Grace Methodist, Shawnee Methodist and First Baptist churches. 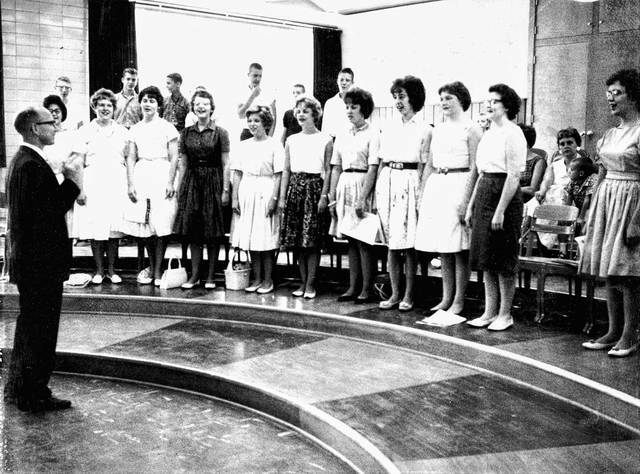 He also directed the Memorial Hospital Nurses Choir in the 1950s, leading them through the hospital corridors during the holiday season to serenade patients with Christmas carols. In such a crammed life, Beckett still found time to sing with the Lima Symphony Orchestra, in musical productions at Encore Theatre — where he also worked as musical director — and with the Lima Civic Chorus. “What I like to do more than anything is sing,” he said in 1992. After retiring from Shawnee, he taught voice for several years at Ohio Northern University. During the 1960s he studied at the Meadow Brook School of Music at Oakland University in Michigan and at Tanglewood in Massachusetts, which is the summer home of the Boston Symphony Orchestra. Reach Greg Hoersten at info@limanews.com.